Search.searchdirex.com is the PUP that uses misleading techniques to prevent removal. Use Reimage to locate malicious components and get rid of them faster than with uninstall instructions. A full system scan blocks virus reappearance and prevents traffic to malicious domains. What is Search.searchdirex.com and is it safe to visit this page? How can I remove Search.searchdirex.com? Search.searchdirex.com virus installs Directions Express browser extension to user’s browsers and then changes homepage settings in them without clearly asking for user’s approval first. The extension is a product of Polarity Technologies Limited, a company that is well known for its browser-hijacking programs. Once it performs these changes, it also employs tracking cookies to watch and observe what websites you visit, your search queries, links and ads that you click on, and similar data. Later on, it uses such information to fill up search results’ pages with ads that more or less meet your interests. However, it is important to realize that these ads can be used as bait to lure you into dangerous or even phishing third-party websites that pose a threat to your computer. That is one of the reasons we suggest you to start thinking about Search.searchdirex.com removal right away. The described browser hijacker might try to force you to use Search.searchdirex.com search engine. We would like to warn you that doing so can be dangerous! Be very careful not to enter sites that urge you to fill out suspicious surveys, install browser extensions or programs, or simply provide your personal information such as full name and email address. Do not trust such websites and be extremely careful not to accidentally click on a deceptive “download” button in them because you can unwillingly download and install a potentially unwanted program (PUP) or even malicious application on your system. By causing redirects to all kinds of third-party websites, this search engine seeks to generate revenue based on pay-per-click or pay-per-install scheme. 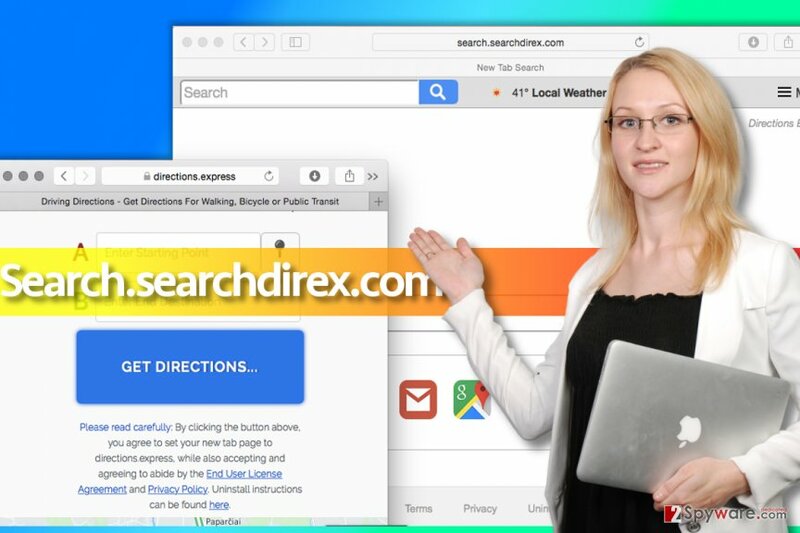 We suggest you think about your privacy and safety and remove Search.searchdirex.com hijacker right away to use a different search tool instead of it. To get rid of the Directions Express extensions as well as other potentially dangerous components from your system, we highly suggest using Reimage software. If you haven’t heard about software bundling, you should know that it is one of the most popular freeware distribution methods that also contributes to the proliferation of many potentially unwanted programs. This method helps to fool inattentive computer users and force them to install various third-party programs such as adware or browser hijackers. The user simply downloads a free program from the Internet and launches its installer. A typical user tends to rush and just go through the setup steps without even reading what information they provide. The most important information is hidden in the “Settings” stage, where the user has to select particular software installation method. Remember that choosing Default or Standard ones will grant your permission to install suggested third-party programs; meanwhile, Custom or Advanced will let you to look through the list of additions and opt out the ones that you don’t need. We recommend you to deselect all additions and proceed with the installation then. In order to remove Search.searchdirex.com virus manually, you need to find and uninstall all questionable browser extensions. Then, you have to go and uninstall all programs related to it. Finally, we recommend scanning the system with malware removal tool to find all those sneaky files that you may have missed. You can perform a free system scan to see if Search.searchdirex.com removal was completed successful using programs suggested below. Uninstall programs that raise a suspicion to you – especially those that you cannot remember installing! Here, look for Search.searchdirex.com or any other recently installed suspicious programs. Wait until you see Applications folder and look for Search.searchdirex.com or any other suspicious programs on it. Now right click on every of such entries and select Move to Trash. When in the new window, check Delete personal settings and select Reset again to complete Search.searchdirex.com removal. Once these steps are finished, Search.searchdirex.com should be removed from your Microsoft Edge browser. If the shady browser extension that we mentioned earlier managed to hijack your Firefox browser, follow these instructions to remove it. Here, select Search.searchdirex.com and other questionable plugins. Click Remove to delete these entries. Now you will see Reset Firefox to its default state message with Reset Firefox button. Click this button for several times and complete Search.searchdirex.com removal. Here, select Search.searchdirex.com and other malicious plugins and select trash icon to delete these entries. Click Reset to confirm this action and complete Search.searchdirex.com removal. Here, select Extensions and look for Search.searchdirex.com or other suspicious entries. Click on the Uninstall button to get rid each of them. Here, look at the Homepage field. If it was altered by Search.searchdirex.com, remove unwanted link and enter the one that you want to use for your searches. Remember to include the "http://" before typing in the address of the page. Now you will see a detailed dialog window filled with reset options. All of those options are usually checked, but you can specify which of them you want to reset. Click the Reset button to complete Search.searchdirex.com removal process. ^ Tracking Cookie. Symantec. Unparalleled Analysis of and Protection from IT Security Threats. ^ How Can I Identify a Phishing Website or Email?. Yahoo Safety. Resources for Protecting the Security of Your Information. ^ Beware fake online survey sites. ScamWatch. Latest News and Alerts about Scams. This entry was posted on 2017-04-20 at 03:49 and is filed under Stealing programs, Viruses. You can quickly scan the QR code with your mobile device and have Search.searchdirex.com virus manual removal instructions right in your pocket. How did you remove Search.searchdirex.com virus?